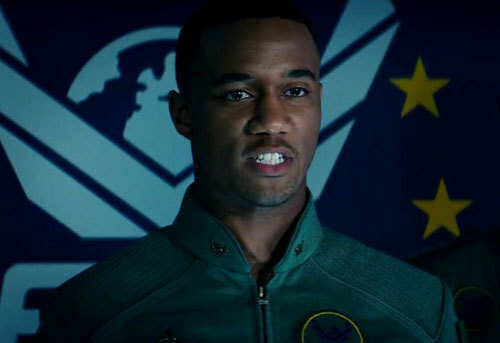 In Independence Day: Resurgence, Jessie T. Usher plays Dylan Hiller, stepson of Will Smith’s heroic fighter pilot Captain Steve Hiller from the first Independence Day movie. 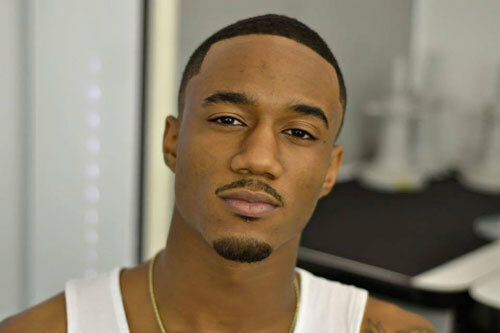 Just as it was for Will, the role is a big breakthrough for 24-year-old Jessie T. Usher who has been starring on TV in series like “Survivor’s Remorse” and the feature film When the Game Stands Tall. He was labeled by “The Hollywood Reporter” as “a rising star”. 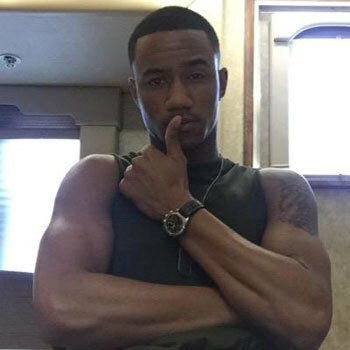 In our exclusive interview, Jessie reveals that he finally met his career idol Will Smith who congratulated him on the role, that his dad is the heroic person he likes to live up to, he’s into Drake’s music and if you want a second date with this hottie, don’t talk about show biz on the first date! 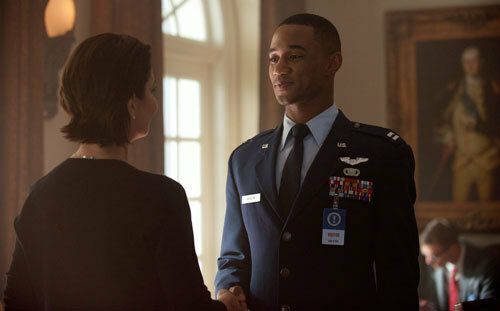 Kidzworld: Your idol Will Smith played Captain Hiller in the first Independence Day film. You play his grown-up step-son in this movie. Last summer about this time, you hadn’t met or spoken to him. Has that changed? Have you met him? Jessie: I have! I met him at the Washington Correspondent’s Dinner. I walked up and said “How you doin’ Will Smith, I’m Jessie T. Usher” and he said “I know who you are” and I almost lost my mind right there. He’s the man, you know and he congratulated me on the role and told me he’d known for a while that I was going to be playing Dylan and gave me a lot of encouraging words and said how happy he was. Jada was there as well and congratulated me. We work with a lot of the same representation. My business manager worked with Will twenty years ago when he did the first Independence Day so small world. Kidzworld: Amazing. When I was on set in Albuquerque last summer I was really impressed with the full-sized alien-hybrid fighter ship on the stage. As an actor were you happy to work with practical props like that rather than all green-screen stuff? Jessie: Absolutely. Honestly, it’s always good to have something that you can feel and see and that works. You can really get into the character. Don’t get me wrong. I loved the blue screen work that we did and the effects work and that kind of stuff because we get to almost do what we want. It’s like being a kid on the playground again. But, at some point you want something to re-ground you. I was very happy that they spent the time and money to make that Moon Base and especially the plane I was flying and feel what that was like and sit inside of it and see that the controls worked. It helped a lot. Kidzworld: Also did you do any training on how to operate a fighter in the cockpit or just wing it? Jessie: I had a run-through when I got into the plane because it was modeled after I believe an F-16 and they told me what the levers are and that kind of stuff. There’s a lot in there that, in the film, I wouldn’t have to worry about. They had a lot of military specialists there and a pilot came in and said “This is how you would take off. This is what you would be doing”, because, on camera, they don’t want you to be like staring forward and lookin’ crazy (he laughs). You’re going to be checking things and making sure everything is a go. Kidzworld: So is the relationship between Patricia (Maika Monroe), Jake (Liam Hemsworth) and your character Dylan really a love triangle that plays out in the film? Jessie: Patricia growing up, her dad (played by Bill Pullman) and my dad (Will Smith) basically saved the world with David Levinson (Jeff Goldblum) so we were bound to grow up together and be friends but she falls in love with the Liam Hemsworth character Jake and I’m the guy that will always be protecting her. With the fact that she and I were so close, he wanted my position at the Earth Space Defense. I was the Captain and would lead the Legacy Squad and if he led the squadron, maybe she would feel the same way toward him. It caused a bit of a rivalry but ends up okay. He’s the man she loves but I’m her best friend. Kidzworld: Very true to life. How was working with Liam? Jessie: We had quite a bit together. At the beginning of the film, he’s sort of on punishment where he’s not allowed to fly because of mistakes he’s made but when things get bad we have to call in everybody that we have and we bring him in. He’s a great pilot. He’s a great actor. He brings a lot to the table and he’s fun to work with. He keeps it light. He’s very chill. It was nice to have him around. Kidzworld: What impressed you about working with Roland Emmerich as your director? He has this huge imagination. Jessie: Roland is a genius. He’s a mastermind. I couldn’t even imagine what it was like for him to really wrap his head around doing a project like this with so much going on all the time. It was incredible to watch him work. He would take the action and make it real for the actors, to create this universe, the world around us basically just from an image in his head that he is able to portray to everybody else and then pay attention to the most fine details. It was incredible and he knew specifically what he wanted from beginning to end. He just had it together. Sometimes you run into directors who will say “Well, if you don’t know, I don’t know” but that’s not him. Kidzworld: Like Dylan, have you ever had a hero in your life that you felt you needed to live up to? Jessie: My dad is an incredible human being. He’s done a lot for my family and has always been there. He put me in a position to do what I do. I can only hope to continue to live my life and do as many great things for my future children as he has done for me. Kidzworld: Awww. Most exciting scene to shoot and hardest scene? Jessie: Same scene. Most exciting and hardest to shoot was this whole sequence where Liam and I were waist-deep in like a big tub of water and there is a whole lot going on there. It was physically rough but it was a lot of fun. We got our chance to do things that I never thought I’d be able to do. I’ve never shot underwater before. I never got a chance to really let loose and rip and run in a pool with all these effects and action sequences in there. It was very complex and specific but we were able to let loose and have a blast too. I was very happy with the way it turned out too. Kidzworld: Do you believe we are alone in the universe or that “they”, whether good or bad, are out there somewhere? Jessie: I think so. I couldn’t put a face or personality on it but I think there is some type of lifeform that exists outside of Earth. From what I’ve heard, we haven’t had any contact or real communication but scientists have dedicated their lives in the belief that it is very likely. I agree with them. I think it’s very likely. Kidzworld: Let’s get to know you better. In your latest pictures, you have a little goatee going on. Is that for a role or what’s up with that? Jessie: That’s my own thing. I’ll go with anything that makes me feel a little older. I like it. I have a babyface. Kidzworld: I’ve read that you went to school for culinary arts so whoever gets you is going to get a great cook. (He laughs). What is with the cooking thing? Is your family full of great cooks? Jessie: Yeah, but nobody’s ever gone to school and tried to do it professionally. I always wanted a restaurant and said I wanted to design my own menu so I joined this Culinary Restaurant Management Program and I was going that route but everybody in my family can cook, my uncles, everybody. Kidzworld: Are you and the family going to cook outside for 4th of July? Jessie: Me and my family are going on vacation right after the 4th so we will already be in Miami so we won’t be doing much cooking this year but we’ll find some good spots to go to. Kidzworld: I’ve also heard that you love to dance. Ever do that in a film or want to? Jessie: I just love to dance. I took some classes and did it in musical theater. Dance was always a part of my life but mostly just for fun. I never thought about being a professional dancer. Not at all. Kidzworld: What music are you really into now? Jessie: I like Drake’s new album. I’m the first to line up for him. I’ve always been a huge Jeremiah (Jeremih) fan. His latest album is on repeat for me. Love what he does. Kidzworld: Did you have a fave superhero comic or character growing up? Or is there one you would want to play? Jessie: Oooo, I’ve always liked Spider-Man. I don’t know if I’d like to play that but I do want to play somebody cool. Entering into this Sci-Fi world, there have been some huge comic book fans who have thrown out ideas “Oh, you should play this guy!” Maybe I can take a look and see who I’d like to play. I haven’t really thought about it. The Marvel and DC worlds already have like a 10 year plan and know what’s going to happen so to be welcomed into that would be amazing. You never know. Kidzworld: What must a date never do or they won’t get a second date? Pet dating peeve? Jessie: (laughs) Believe it or not I hate it when people talk about acting when I’m not in that atmosphere because I live it all the time. I’m always reading scripts, working or meeting with new filmmakers and always on set. So, when I’m away from that, I want to be away from it and talk about normal stuff. Talk about sports or the gym or just hangin’. I hate it especially on dates when I’m sitting down with somebody and they’re like “What project are you looking at?” I don’t want to have that conversation. That’s my pet peeve. Kidzworld: So you’ve got this movie Almost Christmas with a ton of really good actors. Who do you play in that? Jessie: That film is about a huge family. I’m the “accident” child that comes along a lot later so all of my siblings are about twenty years older than me. This is the first Christmas that everybody is coming back to our parents’ house after our mother has passed. We’re having to deal with that. It’s a great cast. It has the vibe and energy of the movie Soul Food. It’s something different for me. Kidzworld: Is there a person in history that you would love to play some day? Or character in a book? Jessie: Yes, actually. I would love to play Arthur Ashe (an African-American professional world tennis champ). Nobody’s done that. I’ve heard a lot about it happening on and off throughout the last maybe ten years or so. I would love to play people who have left that kind of impact on people’s lives and I think playing that role would be huge and that would be a great project. Kidzworld: We’d go see you in that for sure. 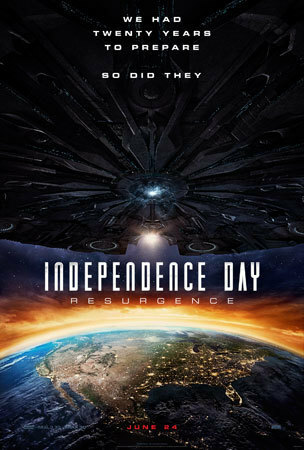 What do you think teens will especially get out of seeing Independence Day: Resurgence? Jessie: Oh man! There’s a huge spectacle draw in this film, the technology used in this is top notch and it is not like watching a video game. It’s almost like you are watching this happen in real life. Roland made sure of that. It’s thrilling and exciting and massive but the relationships are small and specific. We were very particular about building the relationships between people throughout the world. The world is united in a way that we can only imagine. Hopefully teens, who are the future of the world, will see that and want to strive towards that. I’m excited for everybody to see it, especially the teenage generation. 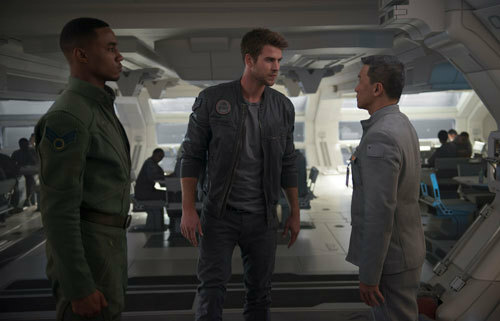 See Independence Day: Resurgence in theaters this Friday, June 24th! 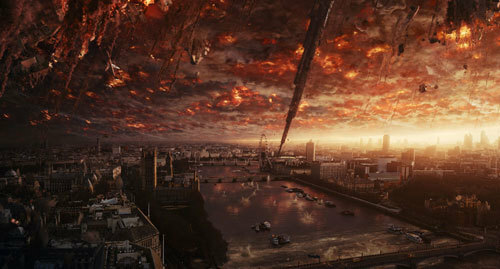 Are you a fan of the original Independence Day movie? Looking forward to this one? Leave us a comment below. Freaky green martians are 'da bomb! Huge-eyed grey aliens are the coolest. The aliens in Star Wars all rock.